Being a wedding photographer I am lucky enough to see wonderful things all the time through my work. During a wedding ceremony, when I look through my camera lens and capture a look of pride in the eye of the father of the bridge it’s because I know when it’s likely to happen and how best to capture the moment. I’ve taken photos at a LOT of weddings, and doing so has given me a sixth sense for when the emotional magic is likely to bubble to the surface. I don’t want to give you the impression I’m cold-hearted about my wedding photography. Not at all. I’m just fortunate enough to have been to a whole lot of weddings. It still gets me every time, why do you think I’ve got such a beard and mad hair? Maybe it’s because once I’ve got my camera up to my face you can’t actually see welling up! Your wedding is one of the most important days of your life. I’m stating the obvious here, but you know it, your parents know it and your friends know it. This is why people are so enthusiastic when replying to wedding invitations. But unfortunately not everyone who you send a wedding invitation to will be able to attend your wedding. Some of your invitees might live on the other side of the world, and while it’s nice to send them an invite so they know that they are still in your thoughts, the chances of them being able to attend may be slim. But there are other people who might live a lot nearer but still sadly might not be able to attend. Unfortunately some of these people might say they plan to come to your wedding but find themselves unable to attend at the last minute, no matter how badly they want to help you celebrate your big day. I was at a wedding a few days ago and saw something I’ve not seen before. Near the front of the congregation was someone holding up an ipad, which while not completely rare is still something quite uncommon. As I got closer to the ipad I realised it wasn’t being used to to take photos or film the ceremony. On the screen of the iPad was the face of someone clearly enjoying being a part of the proceedings. But it wasn’t the face on the screen that was a revelation to me, it was his surroundings. 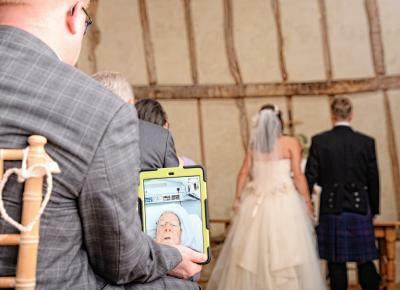 The person I could see on the ipad screen was clearly watching the ceremony from a hospital bed. That’s as much as I know about this extra, and no doubt very welcome, guest the wedding. It has recently become something of a cause celeb and quite trendy to moan about cell phones, ipads and the Internet as a whole. But let’s not forget that these technologies can grant previously impossible wishes. Like being at the wedding of a family man when you’re too ill to leave a wedding bed.